방상시탈은 궁중에서 나례나 장례때 악귀를 쫓기위해 사용했던 탈이다. 궁중에서는 임금의 행차나 사신의 영접 등의 행사 때 사용되었는데, 붉은 옷에 가면을 쓴 방상시 4명과 각종 가면을 쓴 사람들이 때리기도 하고 불이나 색깔 등으로 위협하여 악귀를 쫓는다. 일종의 연극처럼 보이기도 하는 이런 의식은 나라의 큰 일을 앞두고 무사태평을 기원하는 중요한 의식 중의 하나이었던 듯 싶다. 장례때에는 발인 행렬의 맨 앞에서 길을 안내하고, 묘지에 도착하면 시신이 들어갈 자리의 잡귀를 쫓는다. 이 때 사용한 탈은 종이와 나무로 만들어지는데 한 번 쓴 탈은 시신과 함께 묻거나 태워버린다. 이런 풍습은 중국 주(周)나라로 거슬러 올라가지만 우리나라에서도 이미 신라 5∼6세기경부터 장례 때 사용되었고, 악귀를 쫓는 의식에 사용하기 시작한 것은 고려 정종 6년(1040)부터 조선시대까지 이어졌던 것으로 보여진다. 방상시탈은 1970년 창덕궁 창고에서 장례용구와 함께 발견되었다. 길이 78㎝, 너비 73㎝의 대형 탈로서 소나무에 얼굴모양을 파고 4개의 눈과 코, 입, 눈썹 등을 새겼다. 웃는 얼굴에 깊게 패인 주름, 커다란 두 귀가 인상적이다. 눈썹에는 녹색과 붉은색을 칠한 흔적이 있으나 현재는 거의 나무색에 가까운 갈색이다. Bangsangsi Mask was worn by a clown with the title Bangsangsi to drive away evil spirits at a funeral or a narye (annual exorcism) in a royal court. This mask was also used during events in the royal court, such as King's outings, receptions of foreign envoys, or other major occasions. Four Bangsangsi wearing red costumes and masks drove away evil spirits with fire, showing off vivid colors or hitting the air, along with other masked performers. This ceremony, which seems more or less like a dramatic play, must have been an important ritual, wishing for peace and prosperity on national occasions. At a funeral, Bangsangsi guided a funeral procession marching in the front of the line on the way and drove away evil spirits from the burial ground. The Bangsangsi's mask for a funeral, which was made of paper and wood, was generally burnt or buried with the dead body. This custom, which originated in the Zhou Dynasty in China, was introduced to the Silla Dynasty in the 5th~6th centuries for funerals. Later, it had also been practiced to drive away evil spirits since the 6th year of the reign of King Jeongjong of the Goryeo Dynasty and throughout the Joseon Dynasty. The Bangsangsi Mask was discovered along with other funeral supplies in a warehouse of Changdeokgung Palace in 1970. It is a large mask measuring up to 78 cm long and 73cm wide, with a single board of pinewood used to carve out its face with four eyes, nose, mouth, and eyebrows. It has deep wrinkles on its smiling face, and its huge ears are very impressive. There is a little trace of green and red paints on the eyebrows, but the overall mask is discolored to its original wood color. This particular mask was made in the Joseon Dynasty. Since no eye was made on the mask, it is believed to be a model in actual size rather than a mask used for an actual funeral. It is assumed to be a ceremonial mask to ward off evil spirits in a royal court, or the mask was probably hung on the wall to guard properties against evil spirits. 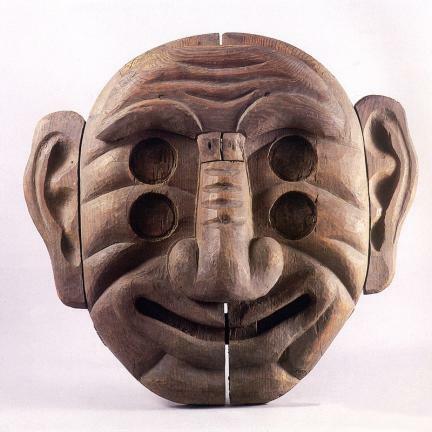 As the only surviving Bangsangsi Mask of the Joseon Dynasty, it had been used since the Goryeo Dynasty; thus serving as valuable material in studying funeral customs and even in researching the history of folk plays.